The recent paper in The Energy Journal by A. D. Owen (1985) provided another important example of an econometric relationship for short-term pricing very similar to those presented by Fisher, Cootner, and Baily (1972) for copper, and Banks (1971) for refined zinc. This short comment merely adds an observation to the pricing behavior discussed by Owen. Other useful presentations of this topic are Owen (1983), and Stephany, Bauder, and Lurf (1981). 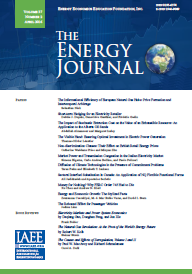 Published in Volume 7, Number 3 of The Quarterly Journal of the IAEE's Energy Economics Education Foundation.